After Castrojeriz, we have Frómista. Moving along, the small town of Villalcázar de Sirga has this stunning Church. 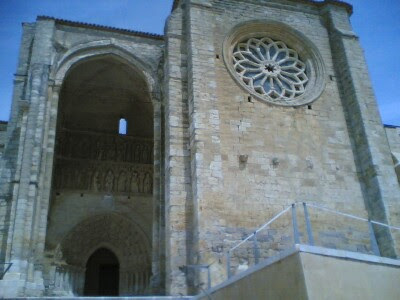 The Church of Santa Maria la Bianca. You can't tell from this picture but the left pillar is slanted. 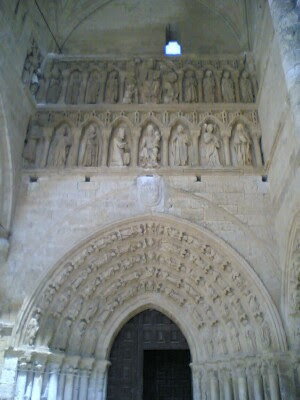 Breathtaking arch of this romanesque church. 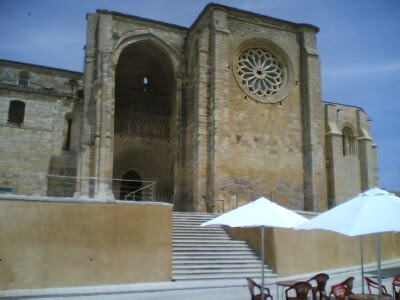 I was surprised to find that the church was opened (most places of worship are usually closed in the afternoon) until I realized that they were charging 2 euros for entrance. I didn't like the idea of paying to go into a church although I must admit that the cool temperature inside the church on such a hot day was pretty tempting. There were also medieval chant music playing inside the church. I decided to make haste to my next stop of the day. What was I thinking? I guess you only find mad dogs and pilgrims walking in the hot afternoon sun on the mesatas.